When I saw this in my head I thought I would magically be transformed into she-who’s-waist-size-equals-her-head-measurement like in the illustration. Nope! Despite the oh-so-Barbie-looking model, my swimsuit didn’t come with a spell that would make my bust-waist-hip ratio equal to those if the gal on the left. I do *like* the suit, but it does look rather frump-tastic on me (the one above was the only pic my hubby snapped that didn’t make me look like a pin-headed rectangle). I don’t have a very curvy figure (which may be the understatement of the year), so even though my heart thrills at 1950s and early 60s clothing, my figure does not. I had to do quite a bit of tweaking to this suit to make it fit. Let me just say, if your cup size is on the small side save yourself a headache and do a muslin to make sure it fits. I know, I know, this should be common sense, but my laziness meant I did lots of little “hmm, I can tuck it here and nip it there and it’s not *that* noticeable”. Bwahaha. But I like it and even if I don’t wear it to the pool or beach I’ll sure as heck wear it around the house when the weather here reaches the temperatures we get in late summer. >I think it looks great!! >I think you look great in this! >ooo! i've always wanted to see that pattern made up in real life. the fabric works terrifically! >It's a gorgeous swimsuit!I am a serial lets tuck here and here no one will notice seamstress… the thing is is that when I do it everyone notices. I can't tell with this swimsuit! >Couldn't disagree more with the frumptastic, I think it looks fabulous on you. So glamorous and such a dead-ringer for the pattern envelope! >Maybe it's the expert photography, but I see curves. That looks so good on you and I love how it almost matches the one on the envelope. Will you be making the jacket too? >I think its gorgeous! Nice job. The pattern is wonderful! >This is really adorable! Is it just made up in cotton? 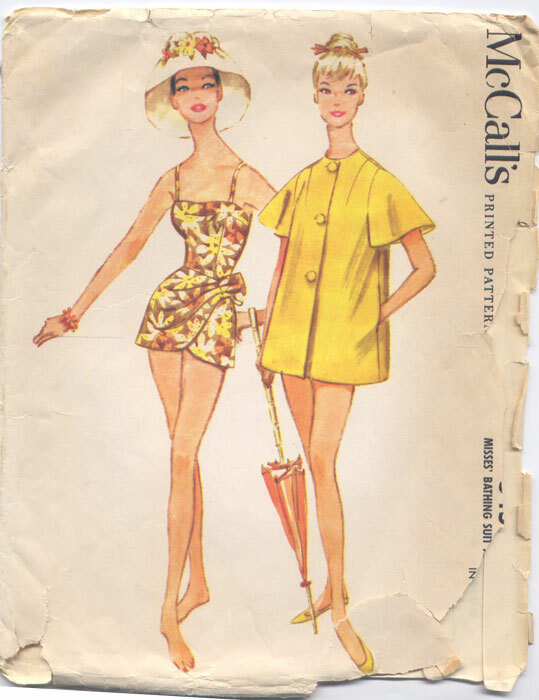 A friend of mine is a teacher at a Christian school, and she was wondering if I could sketch a line of modest swimsuits, and the first thing I thought of was vintage! However, I have been a little puzzled about the fabrics used… I love your blog, btw, it is SO incredibly helpful and interesting! >Completely fabulous!!! I believe it is more wonderful made up than in the illustration…great job!